Create a clean receiving area for plants that will allow room to unpack and inspect plants upon arrival. Before filing shipping documents, make notes on plant conditions upon arrival. Upon arrival, open and unpack the boxes immediately and check the physical condition of the plants. Inspect plants for root and foliar diseases and for insects and mites. Report any damage or discrepancies immediately to your supplier (most companies want to hear within 24 hours). Photographs are also helpful. Place plant trays on benches and water thoroughly with plain water (no fertilizer); be sure that plugs on the edges of the trays are thoroughly watered. Plugs can dry out quickly due to the small volume of growing medium; check the trays 2 or 3 times daily for watering. After the initial watering, apply a general-purpose fertilizer (such as 20-10-20) at 50 to 60 ppm of nitrogen at every other watering. Allow plants to acclimate to the greenhouse conditions for 24 to 48 hours before transplanting. Water the plug trays thoroughly 2 to 3 hours before transplanting; this aids in removing the plugs from the trays. Do not plant plugs or liners that are dry. Prepare your cell packs or pots by filling them with pre-moistened growing medium and pre-dibbled holes for the plugs. Lightly fill containers and brush off excess. To prevent compaction, do not pack down or stack ("nest”) filled flats. Always try to preserve the air space or porosity to insure healthy root growth. Take special care during transplanting to handle plants gently. Stems of tender seedlings can be easily injured when workers grasp or "pinch" the stems too tightly. This often leads to stem cankers causing plants to wilt and die. Avoid planting too deep. Plant plugs at the same depth as the original plug. Some transplants may have elongated stems and it is tempting to "bury" the stem. Resist the temptation, except for more adaptable tomato plants. Rooted cuttings from different wholesale suppliers may contain a variety of growing media. Adjust watering habits accordingly. Place plants into the proper environment. Dr. Claudio Pasian, Horticulture and Crop Science, Ohio State University offers suggestions for grouping crops. Crops can be divided (and grown apart) based upon two environmental characteristics: temperature and substrate pH. Some crops can be grown at lower temperatures than others. 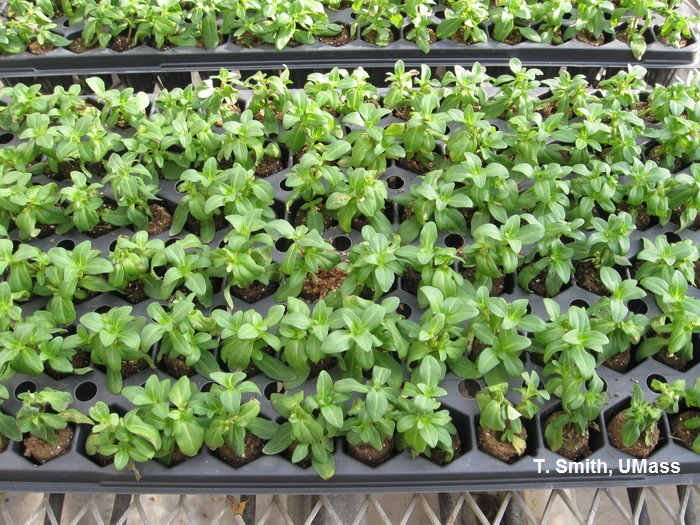 For example, grouping crops that can be grown cool such as nemesia, bacopa, snapdragon, diascia, scaevola, osteospermum, separately from crops that need warmer temperatures such as geraniums, begonias and New Guinea impatiens will allow cool crops to be grown at lower the temperatures and save on energy costs. The cool crops can be sold earlier, or moved outdoors for finishing, making room for later plantings. Within the temperature groups, crops can then be separated based on their substrate preferences. Paul Fisher, University of Florida and Bill Argo, Blackmore Company have divided crops into three distinct groups 1. Geranium 2. General and 3. Petunia based on their efficiency to pick up iron from the substrate. Geranium group (pH range of 6.0-6.6) includes plants that are efficient at taking up iron such as lisianthus, marigold, New Guinea impatiens, seed and zonal geraniums. General Group (ph range of 5.8-6.4) includes begonias, chrysanthemums, ivy geraniums and impatiens. Petunia group (lower pH range 5.6-6.2) includes plants that are inefficient at taking up iron. The petunia group includes calibrachoa, scaevola, snapdragon, bacopa and argyranthemum. Once plants are grouped according to temperature, crops can then be grouped based on their response to substrate pH and crops can be treated differently according to their needs. For example, it is possible to have different injectors in different zones using different fertilizer types: acidic for the petunia group and neutral or basic, or perhaps liquid lime application for the geranium group. Grouping plants may be more easily said than done. However, before transplanting think about how to efficiently manage space and group crops to produce high quality crops. Pasian C. Compartmentalization of Greenhouse Crops. Florabytes, March 2011 The Ohio State University. Argo, B and P. Fisher. Understanding Plant Nutrition: Managing Multiple Species, Greenhouse Grower Magazine.